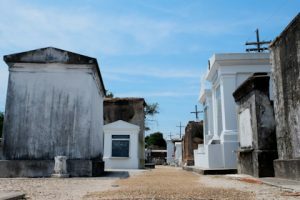 Most people who have heard anything about cemeteries in New Orleans have heard that New Orleans has above ground crypts because the high water tables make below ground burials impossible. The legend could best be summed up in the phrase, “you can’t keep a good man down.” (or bad ones, for that matter.) Coffins, you see, can float, so in times of flooding, below ground burials become aboveground problems. There is some truth to this: some coffins did pop up on occasion and had to be re-interred. 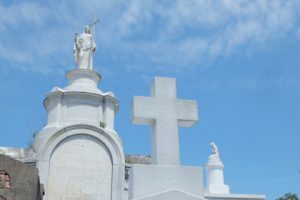 But, although the high water table is a problem, people spent more than 60 years burying their loved ones underground in New Orleans’ first cemetery: the St. Peter’s cemetery. It opened, just outside of town, in 1723, five years after the city was founded, and closed in 1788 because it was full. That, you see, is the real problem with burying people: the cemeteries fill up, and real estate is expensive–especially in a place like New Orleans. Before the developments of pumps which could drain the swamps, only the highest ground in New Orleans could be used. By the time it closed, the St. Peter’s cemetery, located between St’ Peter’s street, Toulouse, Burgundy and Rampart, was inside the city, and rather valuable real estate. So once there was a new Cemetery, the graves were moved and the land eventually was repurposed. At least some of the graves were moved. 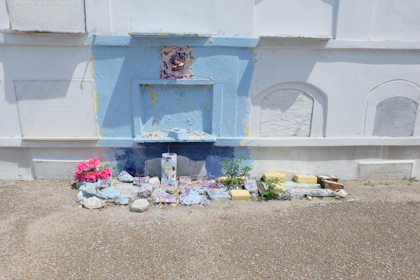 Although many of the graves were moved, many weren’t and every so often when someone in that block of the french quarter does renovations, a few more graves pop up. In 2011 for example 15 graves were found when a property owner went to put in a swimming pool. St. Louis Cemetery #1 opened in 1789, during a period of Spanish rule, and is still open today. The Spanish introduced the custom of above ground burial, which has several advantages. The first advantage for a swampy place like new Orleans is that it is less icky. Bodies don’t pop up after a flood. The biggest advantage of above ground burial is that the same space can be used indefinitely. The St Louis Cemetery has been in continuous operation since it opened, even though it has been reduced in size on more than one occasion. This is possible because above ground crypts can be reused. In a subtropical climate like New Orleans an above ground crypt is effectively a solar oven. Some of the crypts are even called ovens, because of their resemblance to bread ovens. After a year or so of baking, there is very little left of a body. The custom is to wait a year and a day before the next interment. At the end of that time, the bits of the coffin which are left can be extracted, and the greatly reduced remains can be swept to the back of the vault, where they mingle with the remains of their ancestors. 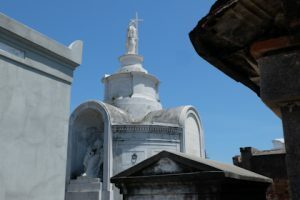 There are several different types of tombs in the St louis cemetery. The walls are lined with “bread oven” style tombs. These were first put in place to deal with the massive deaths during some of the bad plague years. The bulk of the cemetery is filled with family crypts. A family can buy a plot of land from the church, and erect whatever sort of crypt they choose. The architecture is quite varied. Nicolas Cage owns a large pyramid, which is slated to be his final resting place. More affluent families often have multi space crypts with more than one vault, giving them more flexibility in the event of more than one death in the family in a year. Families with a family crypt, but only one vault, have the option of renting (where else can you rent a grave?) one of the wall vaults from the church until the year and a day custom will allow their loved one to be placed in the family crypt. Some of the more spectacular crypts are huge communal crypts for various organizations. The Italian Benevolent Society Tomb is a notable example. The society used pooled resources to provide something spectacular for a group of largely underfunded immigrants. A large, communal tomb such as this allowed for a central area which enabled workers to clear the vaults for new arrivals from within. in 1969 the Movie Easy rider used the tomb as a set, and the results so horrified the church that no film crew has been allowed to film in the cemetery since. (Any film that has scenes supposedly shot in St. Louis #1, such as Interview with a Vampire, used other filming locations. )The society is long since disbanded. The church has since moved the remaining remains from this crypt and currently uses it for storage. 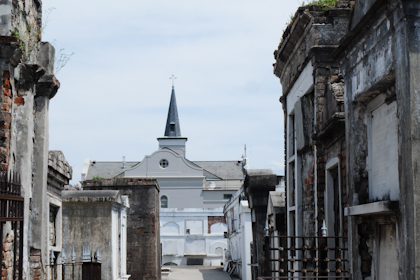 The layout of the cemetery is as chaotic as the French Quarter is orderly. It is approximately a rectilinear grid, but jumbled just enough to make navigation confusing. Some tour guides say this was an intentional effort to keep the ghosts confused and unable to find their way home, but tour guides will say darn near anything. I suspect that it is more likely a result of errors compounding when grave sites were based off the previous sites. (An 89 degree angle looks like a 90 degree, until you stretch the line far enough), or from errors introduced as new graves were shoehorned in between existing structures. If you could visit the cemetery I’d warn you that it is a maze. Many of the lanes are at odd angles, and many lanes have dead ends. It took me a while to figure out the art of navigating by visible landmarks outside the cemetery. From almost anywhere in the cemetery, if you look up and turn around you’ll be able to see the spire of Our Lady of Guadalupe, and walking toward it will take you in the direction of the exit. This is, sadly, now a useless skill, unless I ever do move here and become a licensed tour guide.